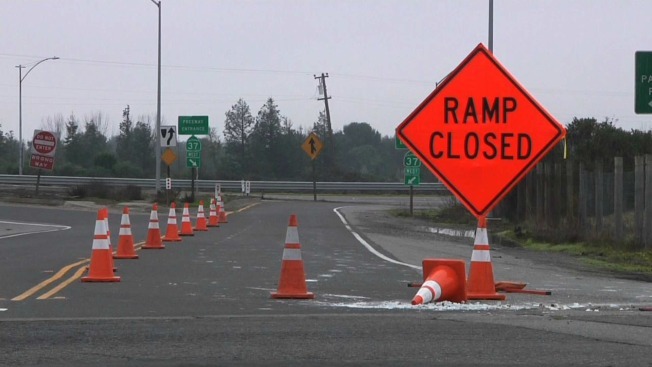 Another round of rain on Sunday completely shut down Highway 37 in Novato between Highway 101 and Atherton Avenue, just days after that stretch of roadway re-opened following previous spells of flooding. The California Highway Patrol believes this recent bout of flooding is just as deep, if not deeper, than last week's episode. CHP officials hope to re-open the roadway at some point on Monday, potentially during the afternoon hours. A vehicle on the westbound side of traffic was trapped by flood waters as of Sunday morning, but the driver was able to be rescued, according to the CHP. Authorities are reminding drivers to never traverse across flooded roads.